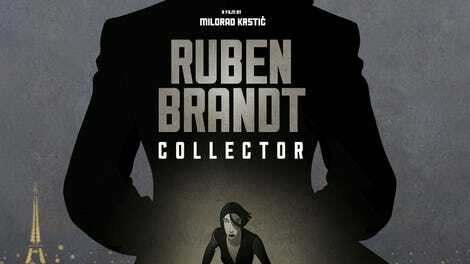 Milorad Krstic’s animated noir caper Ruben Brandt, Collector is a primal nod to both classic cinema and classical art. Well, really, to all art. As films like The Square and Velvet Buzzsaw have sought to identify what art is and how it fits into the modern life, Krstic’s movie offers perhaps the most complete answer: Art is everywhere, ubiquitous and inescapable. What’s so grand about Ruben Brandt isn’t its story or the characters, which are both abstractions. It’s the animation—the detailed artwork, so dense that it warrants repeat viewings. A psychoanalyst named Ruben Brandt (voiced by Iván Kamarás) has terrible art-based nightmares. He treats four criminals for their addictions, but they eventually team up to help him with the bad dreams, galavanting around the world, stealing the famous artworks Ruben sees in his sleep. The plot is nonsensical, with a few silly twists that serve no purpose other than to propel the characters deeper into the art world. Really, you needn’t pay attention to it. Just look at the pretty pictures. The artwork in every frame of this film becomes a kind of patchwork of art history. Again and again, multiple styles and eras converge: a cat evocative of Russian folk art, a woman resembling Botticelli’s Venus, a bird reminiscent of Chagall’s L’oiseau bleu. Even the humans are amalgams of the subjects in the great cubist paintings, with eyes askew or sometimes doubled. But Krstic expands his definition of art by conspicuously placing brand names and labels next to the masterworks. The FedEx logo or the engraved label on a metal music stand are, in this sense, just as much art as a Picasso or Basquiat. In one scene, a character stands on the people mover that runs beneath Michael Hayden’s The Sky’s The Limit, a light-show tunnel in Chicago’s O’Hare Airport. It’s essentially an unfinished public neon art piece, but Krstic’s decision to include it in such great detail forces the viewer to reconsider it as more than mere travel distraction. There’s also a sly statement within the narrative about American art. As characters from major paintings spring to life to attack Ruben, the two American works—Edward Hopper’s Nighthawks and Andy Warhol’s Double Elvis—come after Ruben with guns. Take what you will from that. Regardless, it’s nice to be in the assured hands of an artist who knows his history, leaving behind little Easter eggs for folks in the know. For instance, snails feature heavily in this film, which could be considered just a surreal touch, but the gastropods have been a mainstay of art going back to the Medieval illuminated manuscripts, where knights would battle snails in the margins of biblical texts. Their meaning? Impotence, modesty, anything the artists or viewers projected onto them. Krstic’s film functions much in the same way. For all the art woven into every frame, Ruben Brandt, Collector is actually a bit of a blank slate, with a story so appropriately thin and strange that its meaning is whatever the viewer wishes. It’s art.